Having a freelance writing routine that works is essential for finding success as a freelance writer and creative entrepreneur. 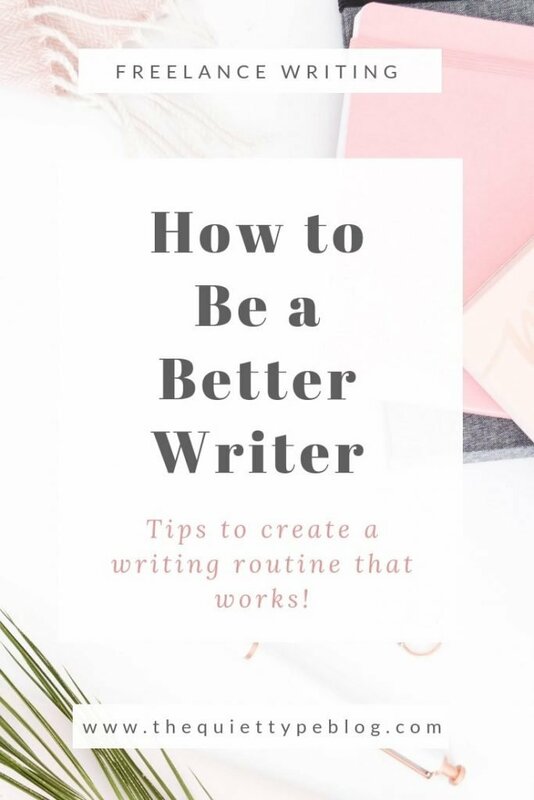 Not only will a routine put you in the right mindset to write, but it will also help to streamline the writing process. 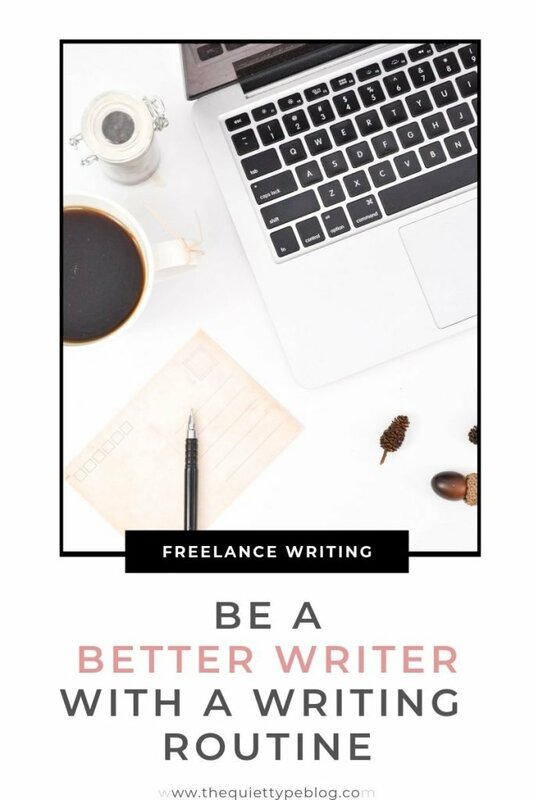 Working more efficiently also creates the opportunity to take on more work and increase your income as a freelance writer. Sounds simple enough, right? It is! 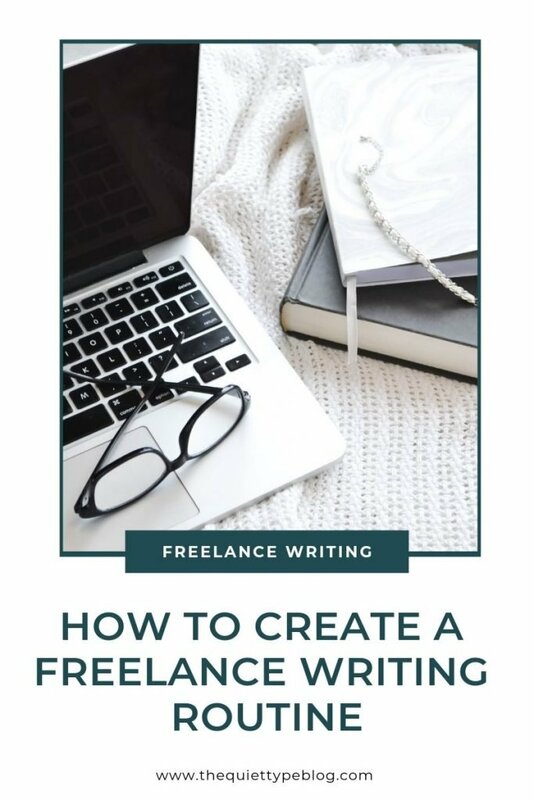 But first, there are a few important steps to take leading up to establishing your freelance writing routine—figuring out when you’re most productive and creating a work schedule. There’s nothing worse than trying to force yourself to write when you just don’t feel like, am I right? No matter how hard you try or how quickly your deadline is approaching, you just can’t seem to focus. Bad news? There will be times a client requires a short turn around time or days when you just don’t feel like writing. When that happens, you have two choices. The good news? Everyone has certain times of day where they seem to hit their peak in terms of crossing things off of their to-do list. 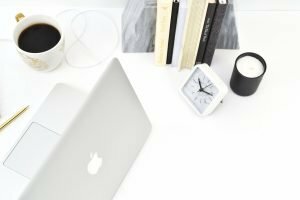 As a freelance writer, whether you’re a side-hustler or full-time writer, you can schedule your time to work to coincide when you feel you’re most productive. When do I feel the most inspired to write? Is there a certain time of day when I’m more focused? When do I seem to get the most work done? Once you’ve identified when you’re the most productive, you can create a work schedule around that time. The beauty of being a full-time freelance writer working from home is the freedom to create your own schedule. When it comes to setting your daily schedule, it’s important to focus it around the time of day you feel the most productive. Having a clearly defined schedule also helps with creating a freelance writing routine because your day is structured and you have a plan of attack for completing work. Not everyone is a full-time freelance writer, though. 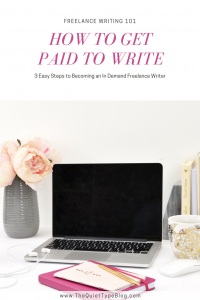 Some are still in the side hustle stage and balancing a 9-5 job with their freelance writing. In that case, setting a schedule around your most productive time may be more difficult, especially if it coincides with your day job. I’ve been there! Here are some tips that helped me complete projects and grow my freelance writing business. → Plan ahead. Know when your deadlines are and a general idea of how long each project will take. Knowing those two things can help you prioritize your work and keep you from accidentally overlooking something important. → Get up an hour earlier than normal for work or stay up an hour later before going to bed. Then use the time to work. It may not seem like much more time, but a little goes a long way. → Try to schedule your lunch break during the productive part of your day. I used to bring my tablet to work and when I took my lunch break, I’d either go to a nearby coffee shop or park my car in a nearby parking lot to write. If your client expects you to come up with topic ideas, brainstorming will be the very first step of your freelance writing routine. Here are a few ways to come up with topics. → Check out forums related to your client’s industry. I recently wrote a blog post for a startup centered around done pilots. One of the things I did to brainstorm topic ideas was visited the forums suggested by the client. From there I was able to identify key topics and questions that appeared frequently within the discussion and create ideas around them. → Take a peek at your client’s existing content. Is there content you can expand on? Perhaps you can create an article or blog post about a service they offer. Is there a long form “ultimate guide” blog post that could be broken down into more manageable chunks and further explained? At the very least, you’ll get an idea of the content they typically publish and use it to spark new ideas. → Hit up Google or Search Pinterest. If you’ve got a vague idea that needs to be developed further, use the guided search function on Google or Pinterest. Both will give you an indication of what people are searching for by populating a keyword or phrase. Then you can build content around those ideas. SEO is an important part of creating web content and should be incorporated into your freelance writing routine. You may have clients who have keywords they want you to use while others may not. Either way, identifying keywords related to the content will be helpful when drafting the article. While researching topic ideas, make a note of what Google populates when you type a topic into the search bar. Are there words or phrases that come up often? What does your client want to be known for? What word or phrase best expresses that and how can you incorporate it into the content? I know not everyone likes outlines and most prefer to just get right to creating content, but I love outlines. I use them for almost all of my writing projects, whether a blog post for The Quiet Type of content for a client. Creating an outline might seem like a waste of time, but they can actually end up saving you time. Sending a client an outline ensures you have a clear understanding of what they’re looking for. Giving them a chance to verify if you’re on the right track will save you from having to make major edits down the road. Plus, clients will appreciate knowing what to expect when you submit your work. Your outline should highlight the key points (headings) you want to make within your article. Then, break up each point with subpoints (subheadings) where necessary. Once you’ve developed the structure for your article, drafting your article will be a piece of cake. With an outline completed, the next step is to draft your article. One of the nice things about an outline is that it breaks the article up into chunks. How you choose to fill in those chunks is up to you. I personally have a habit of working on sections out of order, but sometimes it is best to start at the beginning and work your way down. Keep in mind your draft doesn’t need to be perfect right off the bat. Just work on getting content on the page, for now. So, if you have a lot of spelling or grammatical errors don’t feel obligated to spend a lot of time fixing your mistakes because you’ll take care of them during the editing process. Once you’ve finished your draft, it’s to review and edit it. The first round of editing is the perfect time to reword sentences or play around with the order of content. If you feel something doesn’t flow well, make the proper adjustments. Also, if you’re client expects the post to be formatted in a specific way this is the time to ensure you’ve followed their guidelines. When I do my first round of edits, I also like to make a note of words I used frequently so I can change them. For example, while writing a recent article for a client I noticed I was using variations of the word “undergo” a lot throughout the document. Noticing that allowed me to switch it out for a different word, which helped the article read much better. For the first round of edits, I recommended taking a brief breather before editing your draft. This time, I’m suggesting waiting 12-24 hours before reviewing your draft a second time and doing a final round of editing. By giving yourself space away from your work, it’s not as fresh in your mind and you’re able to review it with a more critical eye. This technique may not be possible for every project, but I highly recommend it if you can fit it into your schedule. The fresh perspective you have gives you the opportunity to fine tune your work before submitting it to your client and you’ll be happier in the end as a result. At this point, your draft should be looking mighty fine! Before turning it into the client, though, always make sure to proofread it. That’s a lesson I learned quickly in my first year of freelancing and not taking the time to proofread is a mistake I haven’t made since then. There’s quite like the embarrassment of handing in a final draft with errors! If you’re worried you may miss errors in your own writing (it happens) here are some tips to help you out. Ask a friend or fellow freelance writer to read through it. Invest in Grammarly, which checks grammatical/spelling errors and sentence structure. Read it out loud or use the “read aloud” tool in Microsoft Word. Don’t focus on every type of error at once. Instead, check for one or two types of errors on each pass through. 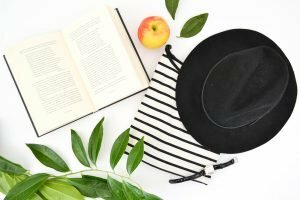 Here are some extra tips that have helped me develop a freelance writing routine that works for me. Part of what makes my freelance writing routine so successful is that I batch my tasks. If you’re not familiar with batching, its where you work on similar tasks at one time. For example, let’s say I have three blog posts to write for the day. Rather than going to through the whole process step by step for one blog post, then move onto the next blog post and the next, I’ll work on all three simultaneously. So, I’ll brainstorm topics for blog #1, #2, and #3 before moving onto the next step. A big part of a successful freelance writing routine is having a quiet place to work. Ideally, your workspace should be comfortable and free from distractions. Not everyone has the extra space to convert an extra bedroom to an at home office so you might have to get creative. When I first started freelance writing, my two best options for working at home included my bedroom and the kitchen table. Since our previous bedroom was a little cramped, my only option was to sit in bed and work which could get a little uncomfortable. Investing $30 in a lap desk like this one helped! It’s basically a little table that sits over your legs and can lay flat or be tilted up depending on your needs. Headphones were also a lifesaver when working at the kitchen table! You could be at the peak of your productive time zone but feel like you’re getting nowhere. It happens. Whether writer’s block or a lack of inspiration, there will be times when it’s best to take a break. If you find yourself struggling with your freelance writing routine or starting to feel burnt out, take a step back. Go for a walk around the neighborhood, workout, or sit and meditate—just do what makes you feel good! Once you’re feeling refreshed and recharged you can pick up where you left off. Sometimes we confuse writer’s block or a lack of inspiration with procrastination and fear of starting. I tend to be a procrastinator at heart, so when I’m feeling unproductive I use the Pomodoro Technique to identify what’s actually going on. If you’re not familiar with the Pomodoro Technique, its where you focus on one task for 20 minutes at a time. I’ll set a timer and focus on writing for that 20 minutes. If I’ve managed to make progress when the timer goes off, I know I was just procrastinating getting started. On the other hand, if I’m still struggling when the timer goes off I know it’s a sign I need to take a break. Developing an effective routine may require trying different things until you land on what suits your needs. Your schedule may change from day to day, too. That’s okay! Flexibility is part of what makes being a freelance writer so enjoyable. Once you’ve found a freelance writing routine that works for you, stick with it!